ScootBiz is the business class tickets on Scoot Airlines, the low cost offshoot of (SIA) Singapore Airlines which has introduced a new deal before its June 26 2012. Scoot Biz (Business Class) flights are currently been sold for $320 for the Sydney,Gold Coast to Singapore destinations. The pricing is based on 1 way tickets and it could cost about $640 return air fare. Its no surprise that "Zim" a german firm who designed the airlines seats for the premium economy class chose a leather and much better colour scheme with ac power sockets integrated into the foot rests. The business class cabins are situated right in front of the aircraft, using boeing 777 and 200 planes. Scoot Biz allows passengers to chose their own seats when booking online and offer the comfort of priority check-in at the airport. Part of the Scoot business class benefits is that they offer you 1 or 2 free drinks and meals, depends on the distance of the destinations travellers are flying too. ScootBiz offers 2 onboard baggage up to 15kg and 20kg check-in baggage. On board you have the extra's of an Ipad 2 thats contains peloaded tv, movies and games. Although scoot airways will have an inflight magazine you can also view the digital version on the ipad as well. 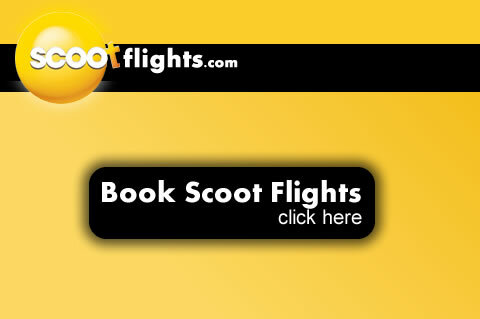 The current destinations for scoot airlines include flights bewteen Sydney, Gold Coast, Tianjin, Singapore and Bangkok. Scoot Airlines destinations and routes will increase as the carrier grows.